Vehicle graphics are the latest hot marketing strategy because of all potential customers they can reach. This popular, low cost means of advertising is taking over how you should market your company by creating a moving billboard on your vehicle or your company's fleet of delivery/repair trucks. 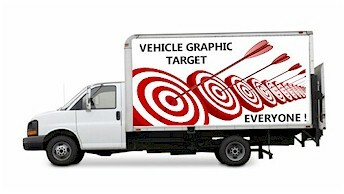 With a vehicle graphic you are going to be noticed, turning your vehicles into eye-catching advertisement. Vehicle graphics should be an integral part of your advertising plan!